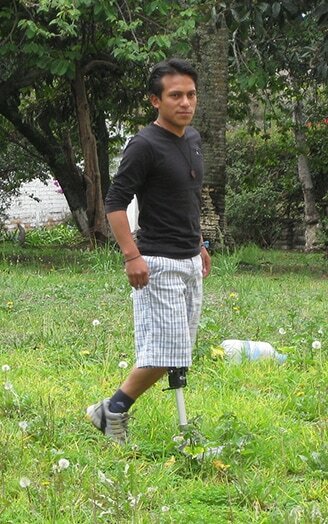 War and disease are among the many reasons people in the developing world are in need of prosthetics, but for Alex Baez of Ecuador, a fateful soccer game is what led him to LIMBS. Alex, who is studying Information Technology in Quito, hyperextended his knee while playing soccer in early 2012. In short, his knee was severely damaged, tearing all his ligaments and tendons, as well as shattering his knee cap. He waited two days to go to the hospital, but infection had already set in. Although the bones were not broken, Alex's left leg was amputated above the knee. Following surgery, he was fitted with a used, but higher-end prosthetic from the U.S. But after being fitted with and using the LIMBS Relief Knee for just a couple of hours, he actually preferred it over the more expensive prosthetic. Alex said he chose the LIMBS Knee because it was lighter than his other prosthetic, but functioned just as well. He went home with a smile -- and the LIMBS Relief Knee.